Ian Cathro stressed today that Hearts won’t accept fifth place in the Scottish Premiership and must be bursting to climb the table when the league resumes next weekend. The Edinburgh club slipped from fourth to fifth last weekend when they lost to Aberdeen and St Johnstone won at Motherwell. 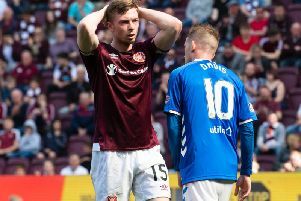 Still harbouring European aspirations, Hearts have a fight on their hands during the remaining nine league games of the season. They host Celtic at Tynecastle a week tomorrow as they begin trying to haul themselves back towards the top three before the top flight splits. “We won’t settle for fifth in any set of circumstances. We have to be ready to compete to push forward and finish as high as we can,” Cathro told the Evening News. “You don’t know what can happen above you. We need to firstly address the situation of falling down a position in the league. We have to make sure we recover the fourth position, then make sure we’re ready to fight throughout the last five games after the split. The top three teams in the Premiership come May will qualify for Europe, however, fourth place could also be good enough for a Europa League spot if one of the top three also lift the Scottish Cup.